The Volkswagen Type 4 is a compact car manufactured and marketed by Volkswagen of Germany from 1968 to 1974 in two-door and four-door sedan as well as two-door station wagon body styles. The Type 4 evolved through two generations, the 411 (1968–72) and 412 series (1972–74). 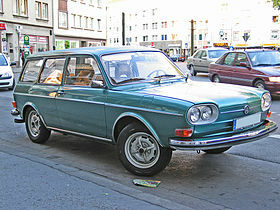 Designed under the direction of Heinrich Nordhoff and introduced at the Paris Motor Show in October 1968, the 411 was Volkswagen's largest passenger vehicle with the company's largest engine – with styling credited to Carozzeria Pininfarina, who at the time had an advisory contract with Volkswagen. The cars retained VW's trademark air-cooled, rear placement, rear-wheel drive, boxer engine with a front/rear weight distribution of 45/55% and a forward cargo storage 400 L (14.1 cu ft) — while also introducing design and engineering departures for the company – including a completely flat passenger area floor and suspension using control arms and MacPherson struts. Volkswagen had prototyped a notchback sedan version of the 411, without introducing it to production. Over its six-year production run, Volkswagen manufactured 367,728 Type 4 models, compared with 210,082 of the subsequent Volkswagen K70 with its four-year model life. In the United States, VW sold 117,110 Type 4s from 1971 to July 1974. As Volkswagen's last air-cooled sedans and wagons, the Type 4 models were succeeded by the first generation Passat, marketed as the Dasher in the USA. As Volkswagen's first 4-door saloon, the Type 4 also introduced unibody construction, coil springs, trailing wishbone rear suspension, hydraulic clutch manual transmission – as well as MacPherson strut front suspension: the 411's front suspension layout was subsequently adopted for the VW Type 1 1302/1303 ("Super Beetle"). When the Type 4 was discontinued in 1974, its engine carried on as the power plant for the larger-engined Volkswagen Type 2s, produced from 1972 to 1979, and for the later VW T25 from 1980–1983. The Type 4's battery was located under the left hand front seat. All models featured ventless driver and front passenger windows, notched on their leading edge to provide draught-free ventilation, no cost metallic paint, radial ply tires, full carpeting, clock, electric rear window demister, flow-through ventilation, undercoating, and a thermostatically controlled auxiliary heating system, specifically, a gasoline-operated heater model BA4 by Eberspächer, fired by a spark plug, accessible from a hidden rear window deck plate. The 411 was also assembled in South Africa beginning in 1969, in two- or four-door configurations. The four-door only came as a DeLuxe, with an optional automatic transmission, while the two-door was available either as a Standard or a DeLuxe. In 1968, Karmann exhibited a prototype for a 411 based cabriolet, but this was not put into production. The 412 replaced the 411 in August 1972 in Germany, having been restyled by designer Brooks Stevens. Halogen lights were fitted, the headlight surround was reshaped and the nose panels were redesigned. In 1974, the engine capacity was raised to 1795cc and fuel management reverted to a twin carburettor system, the 412LE now being renamed 412LS. The visual design of the Volkswagen 412 Variant was followed when the Brazilian Type 3 models TL, Variant and Variant II and later Brazilian Variant based Volkswagen Brasilia was produced in Brazil, primarily for the Latin American markets. In February 1974 on the German market, the 4-door 412L was priced at DM 10,995 (DM 11,145 for the 412 LS). Wikimedia Commons has media related to Volkswagen Type 4. ^ a b c d e f "Test VW 412 LS". Auto, Motor und Sport. Vol. Heft 3 1974. 2 February 1974. pp. 40–48. ^ "News and Views: What's new at Paris". Autocar. Vol. 129 no. 3790. 3 October 1968. p. 59. ^ a b Copping, Richard (October 2005). The Air-Cooled Era in Colour. UK: Veloce Publishing. p. 168. Long the subject of sneak preview photos, the VW 411 bore a passing resemblance to the VW 1600TL, while Pininfarina who had an advisory contract with Volkswagen, is credited with the car's styling. ^ a b "1971 Volkswagen 411, USA Brochure". Volkswagen. ^ Dept of Transportation NHTSA Federal Motor Vehicle Safety Standards. 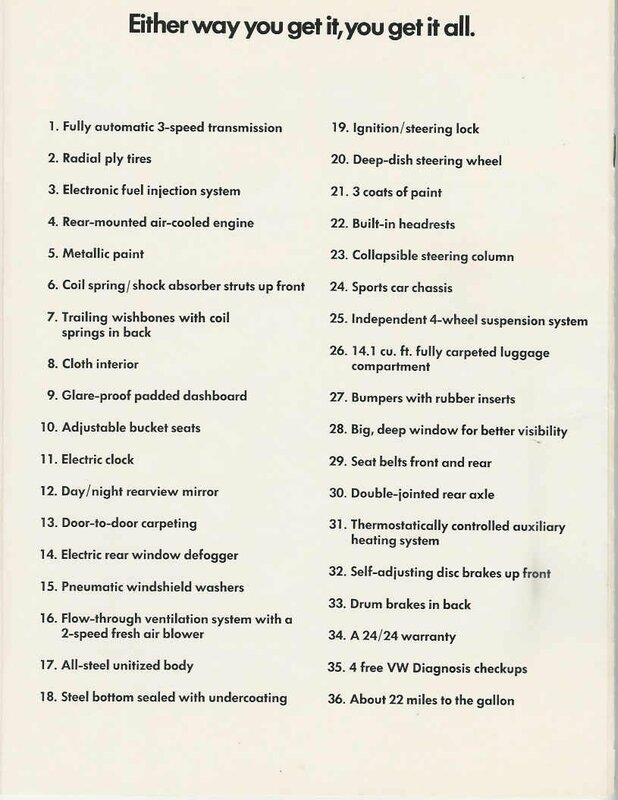 Popular Mechanics, Bill Hartford, March 1971, p. 92. ^ "Volkswagen 411 Cabriolet, 1968, by Karmann. A..." Carsthatnevermadeitetc. Retrieved 24 January 2019 – via Tumblr. ^ "Prototypes". www.type4.org. Retrieved 24 January 2019. ^ a b "Neues vom Markt: Neuer 412: Sicherer, schoener und komfortabler". Auto Zeitung (Nbr 17): Seite 4. 12 August 1972. ^ Oswald, Werner (2003). Deutsche Autos 1945–1975, Band 4. Stuttgart: Motorbuch Verlag. pp. 62–65. ISBN 3-613-02116-1. This page was last edited on 28 March 2019, at 14:56 (UTC).